In the era of the Maine Clean Election Act, a majority of legislators and legislative leaders rely on public financing to conduct their own campaigns. Even those candidates who run privately financed campaigns do so with strict contribution limits. This has greatly reduced the direct role of money in determining who wins and loses individual races and has helped ensure that our lawmakers are not beholden to wealthy special interest contributors. But there is a shadowy system of campaign finance activity operating in parallel to the funding system for candidate campaigns, and legislative "leadership" and "caucus" PACs are at the heart of this system. While fundraising for candidate campaigns operates under strict limits that keep big money from buying influence or access to rankand-file members, fundraising by legislative leaders through political action committees is subject to virtually no restrictions. There is no limit on the amount of money one contributor may give to a PAC, and corporate and union contributions are permitted. Using publicly available data, this report finds that vast sums of big money flow through PACs controlled by legislators. These PACs exist for the purpose of advancing personal interests and party agendas, and big donors contribute to these PACs for the purpose of shaping the legislative agenda and assuring access to legislative leadership. The legislative process whereby policy initiatives succeed or fail cannot be fully explained without understanding the continuing role of money in Maine legislative elections. Over the ten years of this study (2002 – 2012), more than $12 million flowed through PACs controlled by candidates and legislators. That's a lot of money in Maine politics. During that period, legislators raised over $5 million from a handful of major players with commercial, vested interests, each of whom gave over $60,000. Tobacco giant Altria (Philip Morris) was the largest corporate contributor at $122,576. 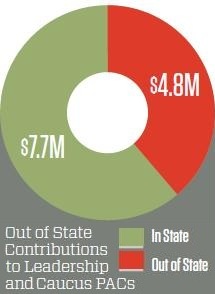 Contributions from these major donors far exceed contributions of any size from individuals, and they dwarf contributions from Maine people of ordinary means. Only 13% of all funds given to these PACs came in amounts of $350 or less. The specter of legislative leaders disavowing private money for their own campaigns while raising tens of thousands of dollars through PAC fundraising has led to charges of hypocrisy. But this is not just a problem for Clean Elections. Privately financed candidates who abide by low, $350 contribution limits in their own campaigns are allowed to raise funds without limit for their leadership and caucus PACs. Contributors who reach the $350 contribution limit to candidate campaigns are only too happy to seek further influence by making separate, unlimited contributions to PACs controlled by those same privately funded candidates. Proposals to close these loopholes have been put forward in each of the last three legislatures, but none has ever come close to passing.